Can't get enough of donabe steaming. We did donabe steaming dinner 2 nights in a row. 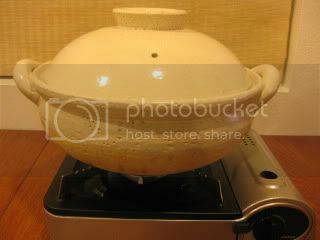 This time, we are back with our "regular" Donabe Steamer, "Mushi Nabe", for gas stovetop. It made me feel like home, indeed. 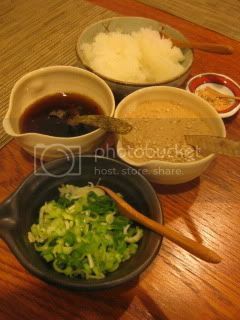 After all the nice restaurant dinners in New York last week, I was craving for my own healthy home donabe meal so badly. I quickly got together ingredients and it was ready to go. 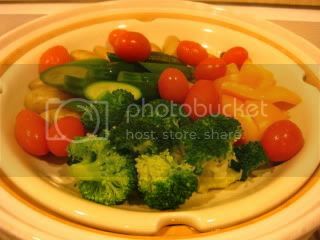 We started with another batch of simple steamed vegetables (served with sesame-soy sauce). Sooo nice. 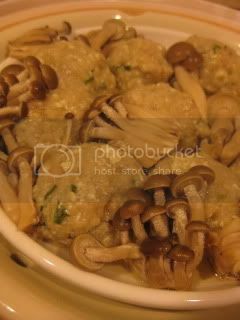 The main course was lotus root and tofu dumplings, with shimeji mushrooms. 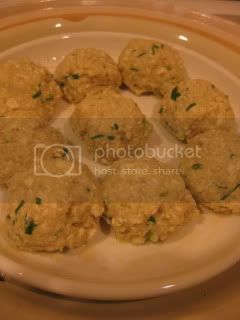 I mixed together grated lotus root (about 10 oz or so), tofu (about 6 oz, drained), some minced scallion, 1/2T ginger juice, 1/2T yuzu juice, 1.5T katakuriko (potato starch), and 1/4tsp salt and made into dumplings. They were put on a plate and steamed in Mushi Nabe for about 10 minutes. I served them with ponzu sauce and grated daikon. They had the nice bouncy texture (almost like mochi), and the flavor was so pure and great. 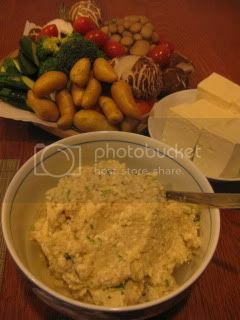 And, of course, to accompany these dishes, we had donabe rice, and donabe miso soup (tofu & wakame, with our homemade miso). Totally my kind of meal.